I have had many magical beings bless my life. 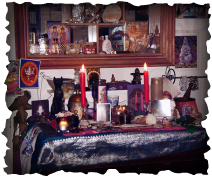 My altars are ever evolving. Creating a sacred space is crucial. Here are some of mine and others that have inspired me! Life without Magick; it's inconceivable!